The E-Blue Mazer Mechanical keyboaard is an unapologetic melding of elegance and industrial design. The gold brushed alu-metal combined with mechanical shafting brings a new era to mechanical keyboards. There are floating keycaps designs have double color characters that reduce touch resistance and faster reaction response; double color injected characters ensure durability without fading problems. There is a customizable back lighting system with different modes that allows gamers to adjust the lighting to their liking. Options are: Wave, Marquee, Ripple, Light shadow, reactive, customization.The keyboard is conflict free. It also has 50 million keystroke life and does not stop the crazy rhythm of the game. 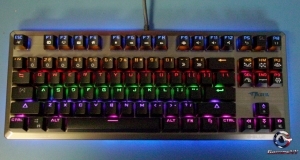 The keyboard has acceleration, 3 speed adjustment that allows you to operate more smothly when you're starting with an enemy.When the keyboard is last shut down, it has the next boot lighting state and ahve a light memory function.Latstly, there are 12 multimedia shortcut hotkeys, that you can enjoy both games and entertainment.